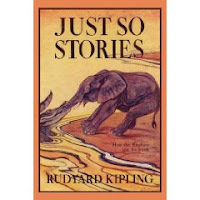 This Beautiful Grace: From the Shelf :: "Just So Stories"
From the Shelf :: "Just So Stories"
Absolutely Delightful, O Best Beloved! This is our current read-aloud. We have read bits and pieces - especially "The Elephant's Child" before. But this time we are reading it through - one whimsical story at a time - and are thoroughly enjoying it. It is music to my ears to hear the kids beg for more. These stories are not deep moral lessons or rich tales of history. They are sheer silliness. But written in some of the most delightful prose that has ever rolled off my tongue. They are a blast to read aloud. The words are so much fun, sometimes Rudyard him self will stop and revel in them. Even if you don't have kids or your kids are too cool for reading, I dare you to get this cheap little book and read it aloud to yourself. If you have any appreciation for wordcraft whatsoever, you will simply be compelled to be delighted. Kayla is now seven, and has the most fantastic sense of humor. She understands sarcasm and dry humor and she and I have a blast laughing at things th at fly right over Karissa's prissy little head. "Well, suppose you say that I said that she said something quite different. I don't see that it makes any difference; because if she said what you said I said she said, it's just the same as if I said what she said she said. On the other hand, if you think she said that you were to uncoil me with a scoop, instead of pawing me into drops with a shell, I can't help that, can I? (p. 54)"
"Nobody said anything at all for a long time, till the Head Chief laughed; then the Stranger-man (who was at least a Tewara) laughed; then Tegumai laughed till he fell down flat on the bank; then all the tribe laughed more and worse and louder. " And mercy, we laughed too. I would like to have had lunch with Mr. Kipling, I should think. Have you ever noticed the difference - when you have conversation with kids or teenagers - between those who seem a bit flat or one-dimensional and those who seem to understand and communicate in deeper shades? I don't mean kids who try to sound grown-up. I mean kids who can have a reasonable conversation with a grown-up about whatever and think for themselves and put words together in meaningful ways. I firmly believe that reading is the window to the world for kids. "“The question is not—how much does the youth know when he has finished his education—but how much does he care? and about how many orders of things does he care? In fact, how large is the room in which he finds his feet set? and, therefore, how full is the life he has before him?” "
The goal of education is to "set your children's feet in a large room." You can train kids to regurgitate anything....times tables, history dates, theological facts. But if you instill into a child a love for reading, a hunger for knowledge, and eyes of wonder....there are no limits to where that child can grow. And talk about a capacity for worship....! Plus...it's just really really fun and cool and special to have the general habit of curling up with your kids and sharing books full of silly nonsense and fantastic bugs and humongous dinosaurs and car-crushing trucks and colorful places and children and ideas. Sometimes I think we understimate the power of seeing and hearing words from a very young age. It sets the groundwork for their language and learning. There are fancy educational names for all that, by the way, but I can't remember one of them. You'll have to ask my sister-in-law Crystal or my mom or some other child-development-education-and-literature expert. But I do know that if I had to make a very short list of things to give to my children....reading together would be on it! Love Kipling! If was my favorite poem growing up. He has such a mastery of language!